Everybody who thinks about it clearly knows that markets are the best way to allocate stuff people want but cannot have in limitless amounts. It is attractive to believe that markets will just happen and be good, if only you just let them do their own things. It is a kind of “let nature decide” point of view. Markets do seem to spring up no anyplace you get more than a few people exchanging anything. But a functioning market requires rules and constraints. Markets need rule of law and they need some general guarantee of trust among participants, as well as balancing mechanisms so that the strong just cannot take what they want making the weak grant what they must. Many of us learned this lesson after communism collapsed in Eastern Europe. Just being free was not enough. Former communist countries needed to build rule of law and institutions to create functioning markets. Where they failed to do this, the well-connected, the quick or just the crooked grabbed what they could and closed the doors behind them. Governments cannot create prosperity; only markets can do that. But markets cannot create the stability and trust needed to make possible exchange that will create prosperity. The challenge is to create enough regulation but not too much, to respect natural and organic developments but to put some guide posts around the ostensibly spontaneous order or markets. 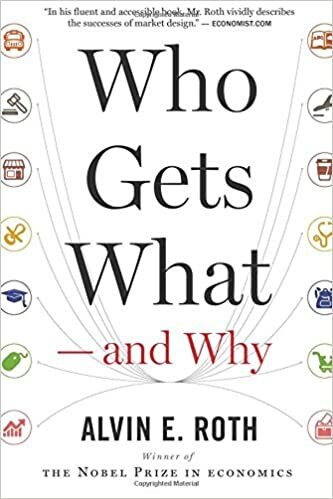 I found significant insight into the above in “Who Gets What & Why.” These were often concepts that seemed so obvious that many of us would think we knew them already, but most of us did not, or not in explained the way in the book. After all, the author Alvin Roth won a Nobel Prize for his work. He probably knows something most of us don’t. When we think about markets, most of us think of the commodity type market, where buyers and selling just exchange based on prices some are willing to pay and others willing to accept. Roth explains markets are broader than that. They are just match making and we can talk about markets in various things w/o money. Roth talks about markets for spouses, admissions into schools and distribution of kidneys, among other things. Markets are human creations (God created wheat, but the Chicago Commodities exchange defines what it means and what quality) that require rules and procedure and these to a large extent will determine who gets what. In good markets rules are consistent and not intrusive. In bad ones they are capricious and heavy handed, but there are always rules. Markets must be “thick” in that there need be sufficient numbers of buyers and sellers. This is addressed by opening and closing rules. When you go to the farmers’ market, sellers are generally not allowed to open until a certain time and they close at a certain time. This ensures that sufficient buyers per hour will be around to make selling reasonable. Roth does not talk very much about the market most of us recognize where all you need is money to buy and sell. He is more interested in those where you choose but also must be chosen. This includes things like employment, marriage and college admissions. Harvard and Stanford could choose a freshman class just by raising the price until it left only those willing to pay, but they don’t. The marriage market is a good example of an imperfect system. There is insufficient information available about the people involved and penalties for making choices in the absence of information. Act too quick and you might end up with someone you don’t like. Move to slowly and the quicker guy steals her away. Roth describes a way we could give everybody an optimal choice. Read about it in the book. Suffice to say that it just works down the lists until all have a place. This system also works for school assignments and has been deployed in New York, Boston and New Orleans. It is worth reading the book just for the parts about matching students to schools, husbands to wives and kidney donors to recipients. Anyway, I think a take-away from this book is that markets are good and necessary and we have to let them work, but that we live in a market economy not a market society. Government, society and tradition will impose rules and constraints on markets. We need to be careful how we regulate and rule, but we also need to be willing to step in if the market, no matter how efficient, is producing outcomes we don’t like.